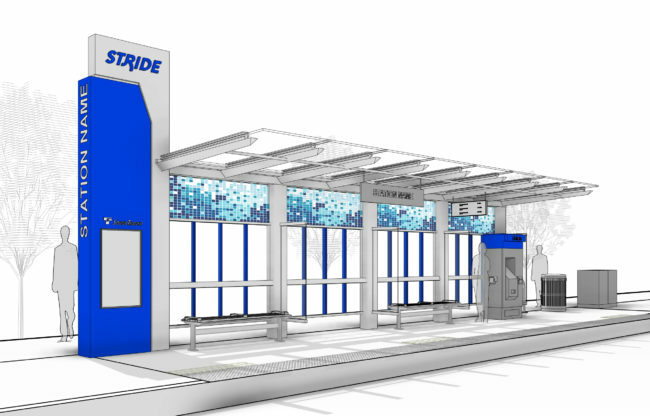 While Stride is only the fourth brand under the Sound Transit umbrella, it adds yet another piece to our complicated mess of transit brands used across the Puget Sound region. Just for BRT and BRT-like express services alone, we have Community Transit’s Swift and its colored lines; Metro’s RapidRide and its lettered lines; and an undetermined brand that will be used by Pierce Transit for their Pacific Avenue project. Sound Transit has not chosen what sub-brand will be used for the individual lines, but they must tread carefully to avoid confusion. Imagine describing a rail-and-bus trip from Redmond to Aurora Village, using a combination of buses: you can take Stride to the (Link) Blue Line to…the (Swift) Blue Line. Trying to communicate the difference would take all day. Compared to other systems with top-down integration of services like Los Angeles’s Metro (which considers its BRT-like services to be equal to light rail on maps and in their names), we’re a ways behind on legibility front. As the system grows further, a serious look at harmonizing transit branding will be needed (and is a subject for a future rant or brainstorm post). Besides the brand name, the I-405 BRT open house also serves to give us a preview of where Sound Transit will place stations. From Lynnwood to Totem Lake in Kirkland, Stride buses will switch between general-purpose lanes and bus-only shoulders to reach stations that are located on various offramps, including a transfer to the SR 522 Line at UW Bothell Station (the 195th Street interchange). It then switches to the median express toll lanes and only exits the freeway entirely at Bellevue Transit Center, where riders would have to transfer to continue further south. The Bellevue-to-Renton section will use a new set of express toll lanes that WSDOT plans to construct by 2024, with a median station at Northeast 44th Street in northern Renton. Stride buses switch back to using general-purpose lanes between South Renton Transit Center and Burien Transit Center, with an intermediate stop at the Tukwila International Boulevard Link station on the shoulder of State Route 518. Sound Transit and WSDOT are proposing the addition of short bus lanes and queue jumps at various offramps to help Stride buses navigate interchanges, but there’s only so much that can be done for non-median stations. Preliminary station designs (as seen in the lead image above) look more similar to those on Community Transit’s Swift than Metro’s RapidRide, with a prominent beacon and larger shelters. Passengers would pay off-board using an ORCA (2.0) transponder or at a ticket vending machine. The station would have real-time arrivals information, seating, wind screens, and a raised platform for level boarding (at all doors). Sound Transit is also soliciting feedback on station access issues via its online open house, with a map that identifies issues for pedestrians and cyclists. Given that most stations will be at freeway interchanges, these impediments are typical of regionwide problems: missing sidewalks, wider-than-comfortable streets to cross, missing curb cuts and other accessibility features, and a lack of lighting on the streets. ST will also collect feedback at public meetings that are scheduled to take place later this year. Oh boy, yet another transit brand. How many is that now? Over a dozen? + Tacoma Link. It’s a hybrid streetcar + light rail and ST has not announced any branding for it beyond today’s. And one card to rule them all, ORCA. HOP, SKIP, JUMP, STAMPEDE, DASH, BOUND, and BOLT. Thanks for the list, Ian. Reminder how lucky we are that we’ve got an electronic fare-card whose possession should be good on all of them. Well, to be fair only one of them has twice accused me of fare evasion over a misplaced card-tap, but that didn’t involve either buses or boats. So as long as I can buy a paper All Day pass before my first Link boarding, close enough, though really pushing to get those jet boats at least from Tacoma if not Olympia. Permanent traffic jam I-5 and Spokane rules out the 594. One phone call to the ORCA Committee, ST Board. Let the Seven Separate Agencies who hate each other fight over their own spiteful little financing. One phone call and make my Pass a Pass as promised and I’ll go ‘way about this. But really, in so much of the bus world, name variety really enlivens the travel experience. A Name including at least one Deity and a variety of brave, fierce, and reliable animals gives the line’s every employee a powerful standard to live up to. The kids will love it, including fighting over today’s theo-zoological choice. Kitsap has two ferry brands: Foot Ferry for Bremerton-Port Orchard/Annapolis and Fast Ferry for Bremerton/Southworth/Kingston-Seattle. And don’t forget the King County Water Taxi. CT, PT, Metro, Island, Kitsap, and Intercity Transit also have Vanpool brands. Don’t forget Metro Access (paratransit) and whatever the other agency equivalents are. Perhaps we should quit calling it 405 BRT now. First, it now has a brand. Third, the Renton stop will be horrible in different ways. Making through riders endure a weave to the exit, through a major signal at Grady Way, through another signal and stop — and the do the same thing in reverse — will compromise the route speed. While the exit at Renton won’t be great, it’ll be *much* better than today. The 560/566 currently get on the freeway at the Park Ave on-ramp near the Landing, and ramp metering absolutely destroys reliability. There’s a short HOV/Bus meter free segment, that doesn’t do much when the bus needs to wait behind half a mile of SOV cars waiting to enter the freeway. If the bus waits with the cars, that adds 10-20 minutes in delay doing nothing, and if the bus driver is aggressive at merging, that can be brought down to 5 minutes with luck. The Rainier Avenue on-ramp is meter free by design (and necessity, because traffic through that point needs to be free-flowing). That part on its own will probably cut travel time in half between Renton and Bellevue during peak. As a 5 day/week rider of the 560/566 (as well as a frequent driver of that part of 405), I am actually most excited about the Renton freeway entrance and exit. The biggest driver of traffic in that part of 405 is people coming from/going to SR 167, meaning the bus can take the middle lane and fly past all those cars queuing for 167. So I’ll call it not ideal, but not really that bad. They can’t fly past those cars in the middle lane if they have to head a block up Rainier to stop at Renton’s idiotic new park-and-ride, and then head back the other way fighting SOVs to get back on 405 north. ST should be using that HOV ramp that the state is spending millions building. Renton’s new park-and-ride won’t feel so idiotic after the express bus to Bellevue doesn’t have to spend 4ish miles in slooow Renton SOV traffic with many traffic lights, stop signs, school zones, non-optimal routing, and long freeway queuing, and instead requiring just two traffic lights, very little freeway queuing, a freeway merge that skirts the slowest lanes. I think a better fight to have would be to move some of the North 405 Stride stations into the center of the freeway so they can be used from the HOV lanes, or extending North 405 Stride to Evergreen Way to connect to Swift. I used to ride those routes through Renton. That was ridiculous. This will be a massive improvement. The Rainier Avenue ramp to SB 405 has a meter. The NB 405 ramp is meter free. Yes, you’re right, good catch. There is a meter on the southbound ramp. It does have a meter – free HOV/Bus lane though, and the queue of cars tends not to be very long on that, so it won’t delay the bus very much. The northbound ramp being meter-free though is a really big deal. Buses are going to pull off the SR 518 underpass and magically and safely transfer to the Link station high in the sky? The TIBS stop will be another horrible problem. Still, I’m not sure if South sling will want to spend the dollars to make this any better. …Have the people designing this even BEEN to TIBS? And/or looked at a map of the 518/99 “interchange” there? There’s no space for what their design shows on the westbound side unless you take a bunch of the exit roadway, or possibly widen it and reconnect it to WB 518. And where exactly are the support columns for the walkway between the EB stop, the WB stop, and the TIBS mezzanine (please tell me it will connect to the mezzanine…) supposed to go? Let alone space for the elevators to and from it? This is either a disaster waiting to happen or they plan on everyone walking up stairs to 99, which would make the stop beyond useless. I think they really missed the boat when they built that HOT lane flyover from 167 to 405. If they put the transit center at the old Sam’s Club Site, widened 405 to create a center lane freeway stop, and then put a pedestrian tunnel from the transit center at Sam’s to the center of the free with escalators and an elevator to the stop in the center of the freeway it could have been so much better. It may be that there simply isn’t enough space there to do have done this, but I am willing to bet that it was never even looked at. Instead they will spend 300 million on an 85th street interchange in Kirkland that won’t really add all that much to the system. You point out a flaw in ST3 development: it was political. Renton is in the East King subarea and got nothing else major in ST3. For a 167-405 BRT using the flyover, Renton could not get their pet parking garage. It has little to do with logic. However, I could see an evolution of this routing. It just won’t have 167 freeway stations. If the new freeway stations at 44 and 85 work OK (and I don’t see why they won’t – other freeway stations get solid ridership as suburban hubs), I could easily see an ST4 project that adds a new STRIDE route that goes from, say, Puyallup to Bellevue and adds 4 or 5 center lane freeway stations. The cost to rebuild an interchange is comparable to building a Link station, but then you avoid the cost of building all the ROW between stations. Regardless, the flyover ramp should provide a massive improvement for STX and KCM routes that connect Pierce/South King and East King. 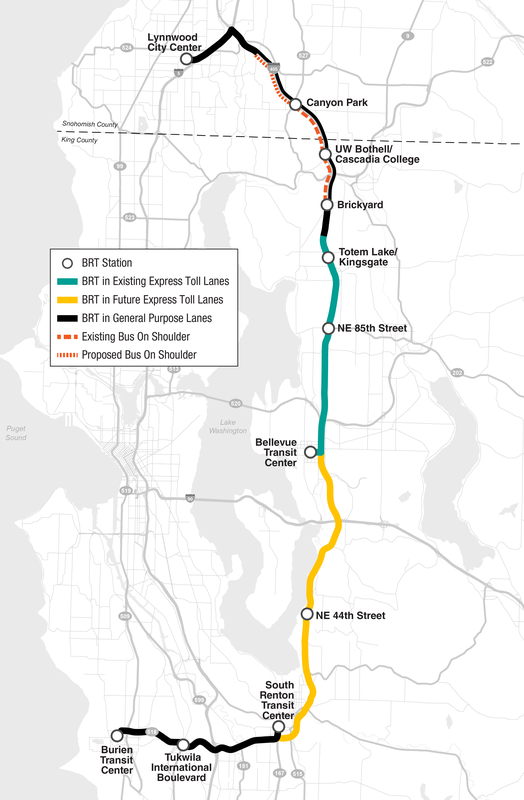 Evolving those STX routes into a 167+405 BRT backbone might be the logical next step, particularly if Bellevue continues to grow into the 2nd largest job center in the region. Fourth, it is not BRT! Yes, this is a big improvement for Renton. The 560 as currently configured is basically for Renton residents: access west to Airport/Burien, or access north to Bellevue. The long surface street stretch through Renton and the freeway exit backups back it undesirable/useless for through travel, i.e. West Seattle or airport to Bellevue. 405 Stride needs to stop at Tukwila Sounder station as well. Why? What Trip Pair would that serve? Everyone coming from further south along Sounder (Kent, Auburn, and Pierce County) who wants to get to the Eastside. Anybody living in Tacoma, Puyallup, Sumner, Auburn, or Kent and working in Downtown Bellevue. I used to be in this boat, along with a number of co-workers. Several of my neighbors do this commute. It is extremely common. East Link will eventually solve this nicely. An interim stop at Tukwila would be helpful though, as would a direct bus route from Kent to Bellevue, bypassing Renton. This would be great for SeaTac access from the south as well. Coming from Olympia, I have to transfer at Lakewood or Tacoma to the 574, and cross my fingers that I-5 isn’t all f’ed up. SeaTac has tried to promote the Tukwila Sounder as an option for SeaTac, but the most they can say is that the taxi ride in between is cheap. The STride and Link will be coming on line at the same time. Actually Link in 2023 and STride in 2024.
as for Seatac access it will be just as easy to transfer at the Tukwila International Boulevard station. Unless you were hoping to catch the Sounder train to the Stride to Link. How would someone going to the airport from Pierce or the eastern portion of South King get to TIBS? a Stride stop at Tukwila Sounder would allow someone to go Sounder-Stride-plane, or Amtrak-stride-plane. To make our long-distance transportation system more sustainable, we need to replace a lot of flights with train trips. Many of the people flying between Seattle and Portland can just take Amtrak for a shorter trip, because they can catch it in downtown Seattle, Tacoma, or Everett instead of trekking to Seatac. However, a lot of passengers on those flights are taking a connecting flight, and they are already in the airport. If we ever get around to high-speed rail on Amtrak Cascades, we will want a quick connection between the airport and the train. Unfortunately, the people who originally decided on the airport’s location didn’t consider this. Unless we can move the airport or bring high-speed rail to within walking distance of the airport, we need a connection. Stride can do that, if it stops at Tukwila Sounder/Amtrak station. The last thing we need is a repeat of the F-line’s mistake, where the all-day bus adds considerable time to everyone’s trip, in order to make a connection that, outside of rush hour, simply does not exist. The 567 is a reasonable solution for the few hours/day that the Sounder is actually running. Stride goes to Burien, not SeaTac, so you’d still be stuck with the same Tukwila-bus-Link or A situation you have now to get to the airport. Eventually, a trip from Bellevue to Tacoma will involving riding the Stride to TIBS, then taking Link the rest of the way. Until then, you’re most likely bypassing the 405 altogether and just connecting between East Link and the 594 in downtown Seattle. It’s out of the way, but it’s one less connection. This would be a great idea is the Sounder Station was close enough to 405 that you could walk there from a 405 median BRT stop. But then, you could also stay on Sounder and take East Link to the Eastside, in probably about the same amount of time. Sound Transit will likely keep route 567 after Stride opens. Route 567 is actually a Sounder connector route, and is timed for connections to specific Sounder trains in Kent. In the draft SIP, the 567 is staying the way it is today, except it’ll be able to use the new HOV I-405 to SR 167 ramp that will open this year. Route 567 will actually be faster than Stride because it’ll make use of the same HOT lanes without making any stops until Bellevue TC. So a Stride stop at Tukwila Station won’t be necessary unless you’re trying to get to Renton. That’s a good example of the type of thing I mention at the end of my comment below. There will still be other express buses to downtown Bellevue. I think in general, the biggest flaw with “I-405 BRT” is the idea that it can be served by one line. A single line, be it a bus line or a rail line, should serve a major destination. In this case, that destination is downtown Bellevue. If it deviates from the fastest means to serve the main destination, then it should be worth the effort. For an urban line, this is easy. Northgate Link, for example, does this. While an express from Northgate to downtown would be faster, the deviation to serve the UW, Capitol Hill and Roosevelt is definitely worth it. If the cost of the deviation is tiny, then it is worth serving as well. The RapidRide E has stops in relatively minor locations, but it costs the bus very little to stop there. Similarly, a freeway station is almost always worth the effort, because the bus can get off and on the freeway so easily. In this case, though, the only big destination is downtown Bellevue. Every other stop is minor, yet requires a fair amount of effort to serve. Exceptions are the Totem Lake and 85th stops (which are flyer stops, and thus can be served very quickly). Regular stops in the north end are so difficult to serve that apparently ST has decided to ignore the HOT lanes, and just run with the regular traffic. The result is a bit of a mess. It won’t be particularly fast during rush hour, greatly reducing its value for the bulk of the riders in this suburban area. Outside of rush hour it will be reasonably fast, but just about everyone will be dependent on feeder buses, which aren’t likely to run very often. This stands in contrast to a trunk and branch system (briefly outlined at the bottom of Dan’s earlier essay — https://seattletransitblog.com/2016/04/27/reduced-expectations-i-405-brt/). Such a system would be more convenient for those headed to downtown Bellevue, and a lot faster if the “trunk” only consisted of flyer stops and downtown Bellevue. The main penalty would be that folks would have to backtrack quite a bit for a trip from say, Canyon Park to Brickyard (assuming the former skipped the latter). My guess is very few people actually make that trip. It will be interesting to see if Metro and CT run express buses over the top of this. Lynnwood to downtown Bellevue seems like an obvious choice, just because it would be significantly faster during rush hour. Metro might run an express from Woodinville, as well as Kent and Tukwila as you suggest. Those would likely only run during rush hour. This BRT would mainly benefit the stops Metro and CT decide aren’t worth such service, and for providing midday connections. It that sense it would be similar to the 510, except that it runs all day. Ridership would be relatively low as a result (the 510 carries less than 2,000 a day) making return on the “BRT” investments (such as off-board payment) very poor. Thing transit always needs most to worry about is the way a system brands itself. Any concept that can put the words “General Purpose” and “Rapid” in the same thought has already left its own cow-hide stamped with a smoking non-erasable located where it renders a seated ride painful. “Symbolism Totally Unable to Complete Kindergarten.” Which thankfully is a simple matter of determination and hard political fighting to correct. I remember a time when I-5 between Seattle and Tacoma had no diamond lanes at all. By the time proposed system is complete, pretty good chance ridership will have reached the point where the only people STUCK will be the ones watching Stride Glide By. Just so everybody knows that in the new world of herding, it doesn’t have to hurt, or degrade value of the hide. I’d be interested in whether the 522 line could have two routes: One whose eastern terminus is in Woodinville, and the other as a branch from the 405 line with a terminus in Tukwila, Burien, or the airport. A 405 branch could give Northshore commuters a reliable option for taking transit to Bellevue, and a potentially easier way to get to the airport. Buses can’t turn around easily at Bellevue Transit Center. Without fixing this, a through route is operationally problematic. The problem with letters is, who gets “A”, Metro, CT, ST, Pierce, someone else? Names work better, since there’s only one Aurora Avenue, only on Evergreen Way, so there will be no bickering over who gets the name. So the 271 would start as I271 and become B271, M271, and S271? Is M271 in Medina or Mercer Island? Does B mean Bellevue, Bothell, or Burien? The Eastside buses would really need an “E”; that would be more like New York’s bouroughs (and how the current 2xx series works), but “E” connotes express. There would be a limited number of letters, roughly corresponding to the hundred-series bus route numbers. Metro 300-399 is W for Woodinville, maybe? Regional ST & CT routes probably an X for express or something. You get the deal – the letters would represent the largest city in the area, not one letter for each of the 50-some cities in the three counties. There wouldn’t be exact boundaries, so if you’re in, say, Shoreline, there would be S, W, and L routes all serving the area, depending on where they go. Routes would not be required to stay in the designated area, so 271 would be B71 for its entire length, even if it does happen to go to Seattle. I can’t see buses in Des Moines, Kent, Renton, or Burien having F or A.
I like the branding system that designates any transit (by technology or operations) that isn’t a local bus by a letter — the using numbers after that. Arterial BRT/RapidRide/Swift with prepaid fare areas as an R#. Sounder Trains with a T#. Express buses as an X#. If an operator wants to call a service by a catchy name, they should add it. It’s cute! Still a rider should expect an operator to have a branding that is consistent. Make consistency a requirement if they want to allow Orca cards. Every time each one of our operators comes up with new branding, I cringe! It’s like calling chicken by four different names to distinguish each brand. It’s chicken (express bus) or a turkey (atrial rapid bus) and to come up with multiple brands for different farms (operators) borders on lunacy and promotes confusion — and makes operators look self-centered about their PR team and not riders or the public at large. We’ll be using Roman numerals and Greek alphabets next if this keeps up! I think the worries about branding are exaggerated. To begin with, the label used for trains is meaningless. As you suggest, you should just use the name, since that is what everyone will use anyway. If I’m standing at the Westlake platform in a few years, and want to head towards the airport, I’ll take the train based on destination (e. g. Angle Lake) not a particular color. Likewise, with the commuter train. We are never going to build something like New York has, where a letter or number designation makes sense — there just aren’t going to be that many lines. That means that labeling the train lines is largely meaningless. Call them by a color, number or letter; it doesn’t matter. You could call Link the 7, right now, and no one would confuse it with the 7 bus. The only issue, therefore, is whether people will be confused with the buses. In general, this problem was solved years ago, as agencies have done a good job of avoiding name conflicts *where the buses overlap*. Where they don’t overlap, it hasn’t been a big problem. I can take the 7, then the 510, then the 7 (from Rainier Valley to South Everett) or the 116, then the 510, then the 116 (from Fauntleroy to Edmonds Community College) yet still manage just fine. Different agencies, different bus systems. On the other hand, there is only one 410 that goes to downtown Seattle. There is only one 510 as well. You mainly only have to worry about confusion when the buses overlap. For the numbered buses, that means continuing with the current system. For BRT branding, CT chose colors, and Metro has letters. Metro can always double up the letters if they want. If I was ST, I would just continue to go with numbers. For example, if the 522 BRT line is called 522 Stride, I think it is pretty simple. The I-405 BRT would be called 505 Stride. An alternative would be to cooperate with Metro, and just adopt letters that happen to be different. If there is a Stride ‘Q’, and a RapidRide ‘P’ and ‘R’, I don’t think it makes any difference (as long as there isn’t a RapidRide and Stride with the same letters). Of all the labeling, I would be most concerned about Swift. Colors can be confusing, especially as you expand. But I also think that like the train, the labels are mainly used on maps, or system discussions. If you are standing there, on SR 99, and want the express, you take Swift. You will take Swift, even when there are a dozen Swifts. It is only when they overlap (e. g. another Swift serves SR 99) that the additional label (color) matters. Even then, though, folks will likely be fine even if they forget the color, as they will take the bus based on the destination (just as with the train). In other words, they will notice it is Swift (based on the color of the bus) then read the top which says “Everett” and take it. While cool on the surface or for one or two trunks, colors have many problems. 1. It’s hard to distinguish more than 6 or 7. 2. Fading in the sun can turn orange to gold, or red to pink or gold to yellow. 2. A decent segment of the population has color- blindness. 3. Creating new route branches or turnbacks can be easier by adding a new route number or letter than by changing or adding a whole other color scheme. As LA just concluded, colors are great for secondary indicators but not primary ones. One of my interns here in the transit newsroom has informed me this will be the first time ST will have Fare Enforcement Officers on buses. Do you think the Metro and Link FEOs all drive to work? Your assignment is to go through the ORCA logs thoroughly and prove the nonexistence of any FEOs ever setting foot on an ST Express bus. My intern read your reply comment, and told me to tell you that Stride’s off-board payment means ST, for the first time, will have to have FEO’s on buses to check for proof of payment. Unless they they do what the Streetcar does, and never have anyone check fares. Why can’t we use drones, dogs, sensors and other technologies to secure our buses. I hear there are 1000’s of TSA and BT agents looking for work. If I’m not mistaken, Sound Transit buses are operated under contract with local agencies (Metro, etc.). I would imagine the fare enforcement would be done by the same folks that do bus fare enforcement for Metro. Regarding the proliferation of brands, note that the ST District is huge; King County has twice the area of the three counties of Tri Met. Regarding the delay for through riders on ST3 I-405 BRT South, the same issue is present for the ST3 I-405 BRT North line at Bothell. The deviation to provide a transfer point with the SR-522 line and serve the UWB/CCC will take several minutes. Pehaps two service patterns are needed per routes 532 and 535. Why is the SR-522 line attempting to go through the traffic congestion on NE 145th Street? There are other Link stations that could be served. NE 145th Street has a full I-5 interchange. eddie, from direct very unpleasant experience…..get it into The Book that it’s blanket termination to use the term “Different Agency”…or service…. as an excuse for refusing to signal for an intended passenger connection. Provided that the employee being terminated is the one that gave the driver permission and encouragement to take that attitude. Because forty years earlier Metro built a P&R there, and it’s a state highway, and the freeway entrance is somehow a plus in traditional thinking. Because it is thought to be the fastest route to downtown, relative to terminating at Northgate or Roosevelt. and because Seattle wasn’t interested in paying for a BRT route down their part of SR522. A: does the relative speed of the alternative pathways depend on traffic congestion; the buses are not flying crows. Also, Northshore riders will want access to Lake City. Is the intersection at LCW/125th fixable? That’s a major bottleneck for buses. But it doesn’t seem like there’s any way to widen LCW without knocking down a bunch of businesses. 145th isn’t wide either, but probably the path of least resistance for getting buses through. Hopefully Metro and ST don’t botch up the intersection at LCW/145th, because that would seem to be a natural transfer point between STride (hate the name), 372, and 65 for all combinations of travel between the station, Northshore, and Lake City. It does. ST is installing BAT lanes the full length of 145th & 522. I’m not sure if it would have been possible to do BAT lanes all the way through Lake City to Roosevelt. And yes, there will still be (presumably frequent) bus routes that connect North shore to Lake City, but the north shore politicians were pretty clear during the ST3 process they did not value connections to Lake City, they simply wanted the most direct connection to Link. The way Lake City was treated throughout the process from the beginning of adding Stride and Bothell Link to the Long-Range Plan shows that Lake City was never viewed as an essential node for the 522 but was simply on the way, and with 145th Station it becomes superfluous. The top destinations for Northshoreites are downtown, UW, the airport, and the stadiums, not li’l old Lake City. However, the 372 is planned to be upgaded to RapidRide, and it goes to Lake City. AJ writes: “ST is installing BAT lanes the full length of 145th & 522”. On SR-522, that work was done by several governments over a long time. ST may want BAT lanes on NE 145th Street, but it may not be up to them alone; the cities may have that power. who has the funding and right of way? @eddiew — Avoiding the congestion on 145th was a key part of the project, and where much of the money for it (from ST3) will be spent. They will widen the street to add bus lanes. Both Shoreline and Seattle are already on board, and aren’t likely to stop it. Shoreline is planning to buy it from Seattle. 146th is more important to Shoreline because it will be the third or fourth largest village and 90% of Shoreline is within two miles of it. In Seattle’s case it’s on the outer fringe of three neighborhoods (Northgate, Lake City, and Bitter Lake) so little reason to invest in it. Sam, if you’re brave enough to be in the same newsroom with them at the same time, you might ask Kellyanne Conway and Sarah Huckabee Sanders if they consider our Fare Inspectors to be a source of coercion or cooperation. On the trains, I see countless passengers ask these officers for information. To me, I think that at some level it should be an open question as to if it might pay to bring back conductors. As the population-majority world’s every van service named for the Lord and any of His brave strong hardworking creatures always carries. Very often these crew members will jump off a full-speeding van and catch intending passengers before they even realize they want to ride. Statistics always chase each others’ tails, but suspect that when revenue loss for wasted operating hours and spoiled passenger relations gets factored in, might be a savings measure to bring back the conductors. Because having watched the process in person as our country’s last great transit age died, could get my PhD. (well it says on YouTube!) using the industry’s own statistics to prove that it wasn’t the cars that killed the great steel spark-throwers, but the loss of their conductors. Who had the authority to, in February in Chicago, make fare evaders GET OFF AND WALK!!!! Sarah! Kellyanne! You girls stop screeching and calling Sam a Mueller-lover. As a child he was always getting his Lionel trains derailed by little liberals putting Lincoln Logs on the tracks! And just wait’ll I find my Magnet Set! Stride will nonetheless improve trip times and provide new regional connectivity. Hopefully it will be popular enough to that WSDOT will consider upgrading to something closer to actual BRT. Like I said, don’t like the feeling of planners willing to put service in regular lanes, call it Rapid, and go home for the weekend. But also think that once the service is there, it’s own passengers will provide an active lobby for lane priority. Is there anything about this project that is truly BRT? Dramatically better than what we have today on the north end with ST532? On the south end, isn’t ST567 better than what this provide? On the north, beyond adding a stop at NE 85th (which has nothing in walking distance) is there any improvement vs. today’s ST532? On the southern portion, is it leaving the freeway to serve a park and ride in Renton, and then going to do the same thing at Tukwila International Blvd? If they aren’t building new infrastructure that is a horrible experience for riders heading to Burien. The whole project feels like a sham. Offboard payment I guess. I think the HOT lanes tend to do really well even at peak. ST’s goal is to have buses running at 45mph in the HOT lanes all day. That’s not 60, but it is also not that far off from the max speed of Link. Honestly, the biggest benefit I see out of all this, which nobody seems to be talking about, is (greatly) improved all-day frequency. Today, the all-day network on I-405 consists of realy just the 535 and 560, each of which running every 30 minutes midday weekdays, once an hour, evenings and weekends. On Sundays, the 535 doesn’t even bother running at all, so you have either detour through downtown Seattle or ride the slow, circuitous local buses (which, themselves, are running only once per hour) all the way. The new route is proposed to operate every 15 minutes 7 days/week, at least until 10 PM or so. Compared to the frequency improvements, the rest of the stuff feels relatively minor. Yes, saving a few minutes in Bothell and Renton is nice, but compared to having to wait 45 minutes for the bus to show up (or, having it not run at all), a few minutes difference of running time, here and there, becomes almost meaningless. Also, the 85th St. stop is more useful than a lot of people give it credit for. The plans call for a complete re-doing of all the ramps, so the pedestrian environment underneath the freeway, while not a walk in the park, will at least be safe. Many people point out that Central Way, from 6th St. to 405, lacks sidewalks, but, you don’t need to walk the same route you would drive, and there are plenty of better alternatives. Here, for example, is a walking route from the Kirkland Urban building to the west end of the 405 interchange, which takes about 12 minutes, and is almost entirely off-street paths (and would be much more pleasant than walking down Central Way, even if it did have a sidewalk). From anywhere north of Central Way, you just take 7th Ave. to the CKC, again, no need to walk down 85th. The CKC itself could also become a corridor for biking (or scootering) that would attract additional people from places too far to walk. Overall, I would not at all consider it crazy for someone who lived in Bellevue or Lynnwood and worked in the Kirkland Urban building to use the Stride+walking for commuting – especially if you choose a place where you can walk directly to the BRT bus from home on the other end, and not need to take another bus. They can’t get off 518 at TIBS because there’s no way to get back on the highway from International Boulevard/99. It shows a stop at TIBS, so unless they are building a freeway station, that means some surface street running. The frequency improvements can all be done without reclassifying it as BRT. It’s sad how little infrastructure is built that really makes bus service work well. The massive Houghton P&R is wasted because it can’t be served without big time penalties. The SR-520 rebuild could have had a freeway stop near 108th Ave as well as direct 405 ramps which would have allowed 252/257/311 as well as 541/542/545/268 to have north-south transfers, including the eventual Kirkland HCT. The 405/167 new HOV ramps seem mainly useless for transit while if some kind of transit stop had been built as part of that project, they could have been useful for both 405 BRT as well as making 566/567 much more efficient and useful. Seems like so many under-engineered roads. Yet they blithely slap the BRT label on it and the uninformed press, public and politicians accept it, but at the end of the day the improvements are of marginal value to transit riders and will ensure that transit has a low mode share on the 405 corridor. There simply aren’t enough useful transfer points and little to nothing is in walking distance. Maybe the exception is BTC, but even that design essentially makes efficient through service impossible. As asdf2 said, the main benefit is all day frequent service. I wouldn’t call that BRT any more than I would call the 510 BRT. The only thing that comes close to BRT is off board payment. For trips of this nature, that is really a minor thing. There will be very few stops, and most people will be headed to or from Bellevue. This is not like the Metro 8, for example, where lots of people are getting on and getting off every couple minutes. The savings due to off board payment are minimal. The time spent getting on and off the freeway to pick them up isn’t. This is neither a good express system, nor anything close to BRT. It is the wrong tool for the job, but a favorite of ST. This is basically a “spine” for an area even less suited for it than Everett or Tacoma. A set of good express “trunk and branch” buses would have made way more sense. Jeez, never run for a bus. That’s cynical. It implies the line is not very good, because it’s so infrequent that people feel the need to run. How about, “the bus itself is running”. 1. Add a freeway median stop at Factoria, built as part of the express toll lane project. Factoria Mall would be close enough to walk to, and intrepid commuters could walk to the T-Mobile offices or catch local buses to Issaquah. 2. There is an HOV lane on 405 between Renton and I-5. I don’t see why “Stride” wouldn’t use it, since there are no stops in this stretch. The map is correct that west of I-5 on Route 518 the bus will have to be in general purpose lanes. Yes, a Factoria stop would be awesome. It would however be costly. It’s yet one more result when ST has not taken time to assess how to make this route be the most productive by refining the ST3 plan carefully before setting it in stone. The only alternatives were sketched out before ST3 adoption. Those apparently only had a possible stop at the Newport Hills Park and Ride and not Factoria. Perhaps the motivation is that Factoria wants the light rail stop on the way to Issaquah more. Meanwhile, Factoria is so close to South Bellevue that shuttles to there (or buses to Mercer Island) would probably be much more valuable. A bus could leave Mercer Island, exit at Eastgate and backtrack to Factoria in less than 10 minutes. Or maybe that it’s as simple as East King views 405 BRT merely as a commuter bus from South King to Bellevue and back — so an extra stop is of little interest or even a thought.